Last night's launch of the 2013 Platter Guide and 5 star revelations confirmed Chenin Blanc's rise to fame and hopefully fortune for long suffering proponents of the variety. No less than 8 were awarded with 12 for white blends many of which contained the variety. Meanwhile Chardonnay garnered only five, two of which went to Jordan and Sauvignon Blanc only three. This edition a record 62 wines made the five star cut, with Cape Chamonix garnering four 5 star ratings. Of the 5 star awarded wines, the red and white which receive the most votes from the judging panel are named Platter’s Wines of the Year. This time the Red Wine Of The Year is Mullineux Family Syrah 2010 (Wine of Origin Swartland), described in the guide as “an icon in the making”, whilst the White Wine Of The Year is Paul Cluver Noble Late Harvest 2011 (Wine of Origin Elgin), probably one of the best ever botrytised Rhine riesling to ermerge in the Cape. This one for Live out Loud - theme of the edition was oxygen. “Love is like oxygen, you get too much you get too high, not enough and you're gonna die. Love gets you high” (lyrics by the band Sweet, ironically their last big hit). So too with wine. Oxygen is wine’s best frenemy – vital in the right doses at the right time, but too much and you’re gonna die, and it starts from the moment the grapes are crushed and continues in your glass and then in your blood stream. With modern wine drinking habits most wines do not need mouth-to-mouth resuscitation but all are destined for a smack on the lips. Taking off the capsule and easing out the cork is not enough foreplay - nor does it allow the wine to breathe. For wine to take a deep breath it has to be decanted. Generally, the older the wine the more it will benefit from decanting but premium wines under screw cap, for example, can benefit from decanting at any age. Mature wines, particularly reds, need some air to revitalise some of their flavours and aromas, even mouth feel, but some are too fragile for decanting. Pour about 50 ml into a glass and re-cork the bottle. Assess the wine immediately, give the remaining wine in the glass a good swirl and then assess it again about 10 minutes later. If you think the wine has gained more intensity or complexity – the change can be huge - decant the remaining wine and allow it to stand for about 30 minutes. It’s probably a good idea to do this trial with all older whites and all premium wines under screw cap. 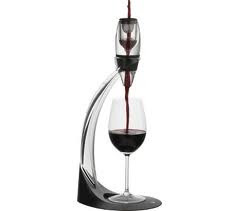 If you are in a hurry, wine pourers like Vinturi aerate wine so you can compare straight samples with aerated ones immediately. Brisk bidding at a rate of R1 million per hour set the tone for a record breaking 28th Nedbank Cape Winemakers Guild Auction in the Stellenbosch winelands over the weekend, with the highest turnover ever of R5 739 000 (excluding VAT) with a complete sellout of all the wines on offer. Unlike Nederburg auction, the CWG auction is open to the trade and general public, and this year’s record sales were 8,6% up on the 2011 turnover of R5 286 700, despite 431 fewer cases of wine. The auction also attracted a record number of 54 new local buyers and private collectors, four of whom were amongst the top 10 buyers this year. The auction, conducted by Henré Hablutzel of Hofmeyr Mills Auctioneers for the 15th consecutive year, attracted 148 buyers including 14 foreign buyers and for the first time, 14 online bidders. In total 2 517 cases were sold at an average price of R2 281 per case equivalent of 6 x 750ml bottles. The lineup of 52 wines included 38 red wines, 10 white wines, 2 Méthode Cap Classiques, one dessert wine and a port. Lies, damn lies, and statistics. The best and worst of statistics and analysis is that numbers can be massaged for own purposes. If producers where negatively weighted by size of production and range of products, Jordan would probably have placed first overall, but with the inclusion of brandy at Veritas and a considerable vintage cellar, KWV once again topped the medal count followed by another behemoth Nederburg. KWV received 5, Nederburg 4 and Jordan 3 double gold (DG). Two of KWV's doubles were for brandewyn and two in museum class. The other top achieving wine cellars in terms of DG and gold (G) medals include: Simonsig (2 DG, 7 G), Boplaas Family Vineyards (2 DG, 3 G), Cederberg Private Cellar (2 DG, 2 G), Windmeul (2 DG, 2 G) and Guardian Peak (2 DG, 1 G). With most pundits talking up the category and it performing better elsewhere, it was surprsing to see no DG for Pinot Noir and a mere single gold for Groote Post 09. Did the usual suspects not enter? The Other Red Cultivars panel (inc Cabernet Franc and Pinot) comprised Colin Frith, Christine Rudman, Andy Roediger, Pieter Ferreira, Razvan Macici, Johann Fourie and Linley Schultz. Writer's special mention - Tokara Pinotage (DG) 2010, Goede Hoop Straw Wine (DG) 2010. Last night's launch by Tops at Spar of their new packaging and new vintage for own brand Olive Brook at Kleine Zalze's Terroir Restaurant was a remarkable balancing act. Michael Broughton's cooking displayed both intensity and restraint as did Tops at Spar's consulting winemaker Tinus van Niekerk. All the wines displayed wonderful juicy elegance and sheer drinkability that is bizarrely lacking in so many of our wines. The other good news from Olive Brook is the value for money for these wines would surely rule the Good Value Awards but currently are not entered - perhaps because they are sponsored by a rival - but imagine the impact if they did garner all manner of gongs from the Good Value Awards. The second annual Christian Eedes Chardonnay Report presented in conjunction with Sanlam Private Investments was announced yesterday. The three man panel includes Roland Peens and James Pietersen. All wines tasted blind with an auditor keeping score. Best value by some distance was the Hartenberg 2010 for R78 - another case of the regular wine out performing the top-of-the-range? I was torn between the Hamilton Russell and Tokara for my top drop but then there was the Uva Mira and the Almenkerk and the Sterhuis, all of them so delicious but will plumb for the Tokara, again swayed by relative value for money. Price: R109 (to be released 1 November). Durbanville Wine Valley is celebrating its annual Season of Sauvignon this coming weekend. With all manner of activities for all ages and preferences, one of the bargains must be wine tasting by helicopter for a mere R750 - that's not much more than a tank of petrol these days. It includes dropping in at three wineries and a cheese hamper. Call 021 934 4405 (4 pax per flight). A craft beer revolution has swept the world off its bar stool and SA is no exception, if lagging USA and Europe. It does however take a lot of bitterly cold beer to make good wine in much of the new world, besides it's a great palate cleanser between long flights of wine. Some winemakers have even taken to brewing beer. SAB have launched South Africa's newsest beer portal with claims that it contains everything you'll ever want to know about beer with contributions from a draft of independent writers. Is this genuine corporate beeranthropy or disguised protection of their interests? Time will tell.